MINSK (Reuters) - Pro-Russian separatists and representatives from Kiev and Moscow agreed on Saturday on further measures to ensure a cease-fire between Ukrainian troops and pro-Russian separatists. 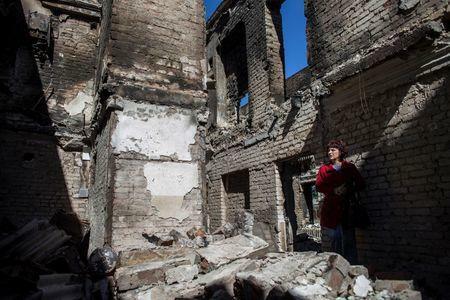 Violations of a Sept. 5 cease-fire between Ukrainian troops and pro-Russian separatists, whom Kiev says have been reinforced by Russian weapons and soldiers crossing over the two countries' porous border, have kept Ukrainian troops on full alert. Former president Leonid Kuchma, representing Kiev at talks of the "contact group", said the two sides had agreed to move artillery 15 kilometers (9 miles) away from the front line on both sides, to create a 30 kilometer (18 mile) buffer zone. "Heavy artillery will be moved 15 kilometers away from the front line," said Kuchma after the talks that lasted several hours in a hotel in central Minsk. He also said that monitors from the European rights and security OSCE watchdog would be checking the 30 kilometer buffer zone along the front line. Ukrainian President Petro Poroshenko agreed to a cease-fire with the rebels shortly after Ukrainian forces suffered reverses on the battlefield that saw them lose a southern swath of the Donetsk region along the border with Russia. Kiev says Russia has helped the rebels with weapons and more than 1,000 Russian troops. Russia denies it has any role in eastern Ukraine.